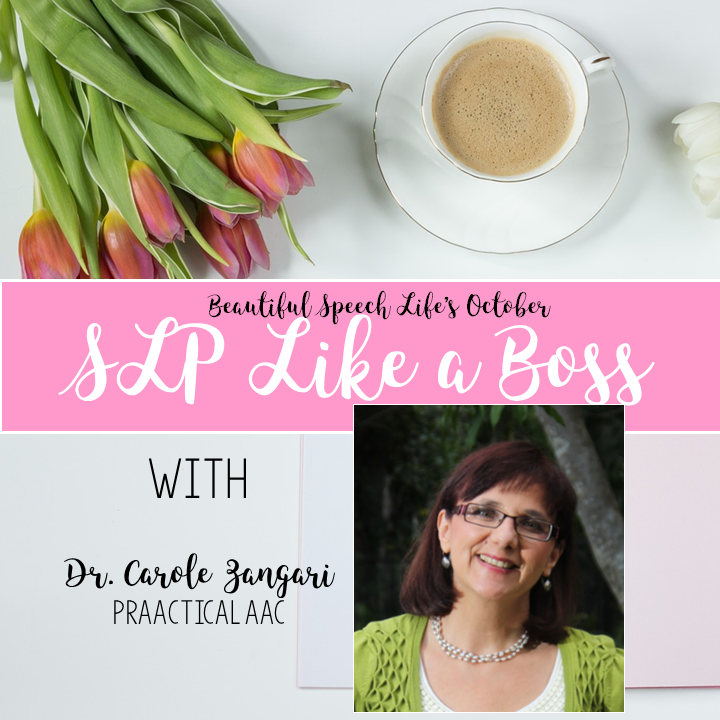 In this series I’m interviewing SLP boss women who work by day as a speech language pathologist, but at night (and on weekends) they are building a business. I’m talking about websites, blogs, courses and therapy materials for their fellow SLPs and teachers. These are women I admire professionally and who inspire me. I write this series because I feel we can all make our practice as SLPs better and stronger by connecting with other SLPs. 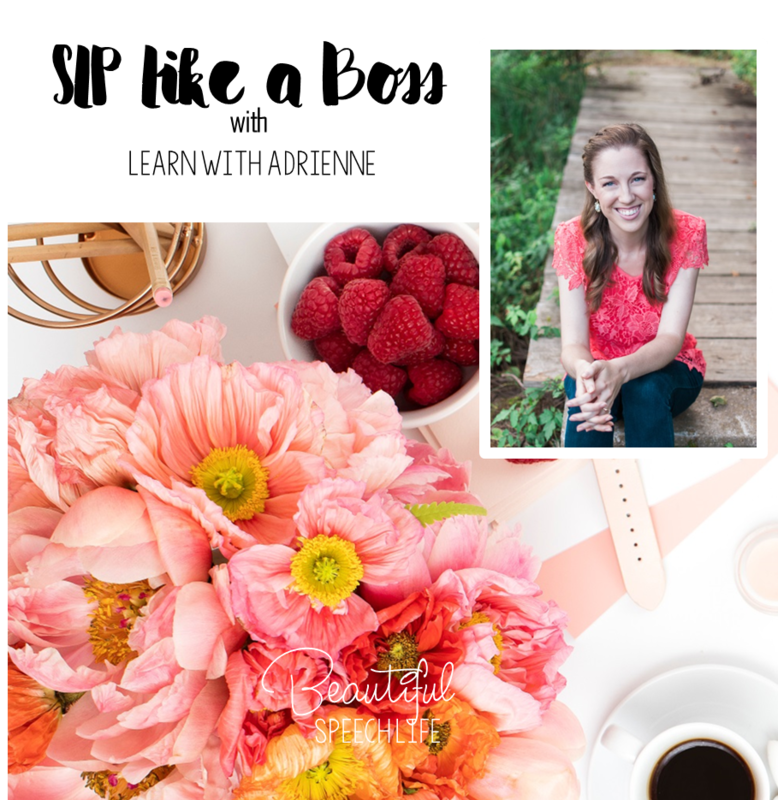 This month, I’m featuring Adrienne from Learn with Adrienne. I met Adrienne two years ago when we took a massive online course together. I’m pretty sure we were the only two SLPs in the class and we became accountability partners. I was one of the beta testers for her course and am so impressed by what she’s created. She is an ASHA certified speech language pathologist who, along with her sign language course, works in early intervention. I teach Sign Language online to beginners. 1. Powersheets Intentional Goal Planner by Lara Casey. I started using this at the beginning of the year. It helps me set goals and have a structured system to chip away at my goals without feeling overwhelmed. My favorite part is the “Tending List” that you create at the beginning of each month. You can find out more about Powersheets on Instagram here: @cultivatewhatmatters Also, I enjoy following the Powersheets creator, Lara, at @laracasey. 2. My Swell water bottle. It keeps my water ice cold in the car between home visits for Early Intervention therapy. 3. My dayplanner: AT-A-GLANCE Academic Year Weekly/Monthly Appointment Book. I have used this type of planner for years. It has a slot for each hour of the day. I book my client sessions, write appointments, block out time for my goals, and plan meals. Love it. My happiest moments are when I am helping people learn Sign Language. I love watching my students add Sign Language to their SLP toolbox while earning ASHA CEUs at the same time. So, I am happiest when I am watching people sign to connect with others. #signtoconnect has become my motto. My best advice is to start an “Aha-Moments” Journal. Aha-moments happen when you least expect them. It is the twinkle in a toddler’s eye when she realizes for the first time that she can use words to make a request. It is the 5th grader who finally perfects their /r/ sound in a sentence. It is the high-schooler who delivers his big Graduation Speech confidently and smoothly in the auditorium. When you are sitting in the audience with proud tears of joy because he has dysfluency and has been practicing his speech with you for months. It is the man in the Skilled Nursing Facility who can remember his daughter’s name again when she comes to visit, because he is using the strategies and tips you taught him. Chase after the “aha-moments.” Cherish them, celebrate them, and strive for them. In your “Aha-Moments” journal, write down whenever you help someone in a profound way. Write it down and celebrate it. When you feel discouraged, or have a rough day, you will have a beautiful collection of moments to remember times when you changed peoples’ lives. At the end of your career, you will have a unique keepsake to walk down memory lane and reminisce about the lives you touched. 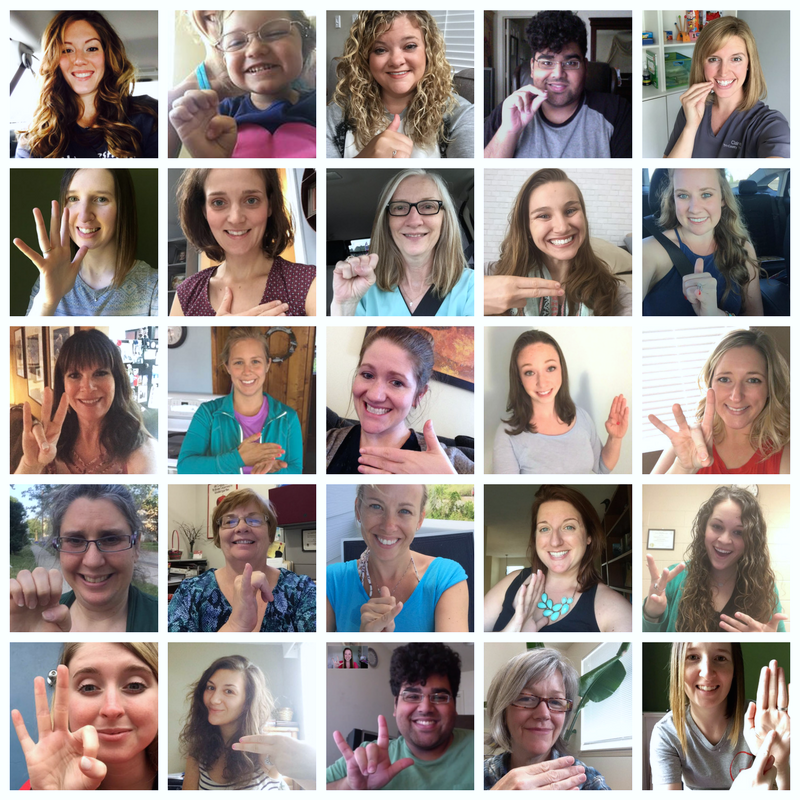 I teach the “Sign Language in 30 Days Online Course” for beginners. This course is for people who have always wanted to learn Sign Language, but feel intimidated. It is for people who are overwhelmed by learning signs from a book or random sources online. It is for people who need to know basic Sign Language vocabulary to use with clients, students, or patients in their speech therapy sessions. As an SLP, I know that earning CEUs is always a priority for me to further my education on topics that I need to use in my own therapy sessions. My Sign Language course is available for up to 5 hours of ASHA CEUs for my students who are SLPs. Before I first started learning Sign Language over ten years ago, I thought it would be so complicated and confusing. But once I started coming up with my own secret strategies to remember the words, I was obsessed! I never realized how most signs look like the words they portray. The language is beautiful. That’s one reason I love teaching Sign Language in my online course, because I can help beginners to learn the basics in 30 days. I shortcut the time it takes my students to learn. I teach them strategies to learn faster and remember signs for a long long time. My students learn over 300 words in one month and have lifetime access to the class online to review in the future. My website is www.learnwithadrienne.com. There, I give away the first lesson of my Sign Language Online Course as a gift. My site also has videos for Early Intervention SLPs. I share ideas and inspiration for therapy activities with babies and toddlers in my videos. Lia Kurtin from SpeechandLanguageatHome.com. She makes amazing resources for Early Intervention on TPT. I use her materials all the time in my Early Intervention home visits. She also has a course about how to go “Bagless” in Early Intervention visits and use the coaching model. If you are interested in taking an Adrienne’s course click here http://bit.ly/learnsignathome for more information. I like the course so much that I am an affiliate. The thing that makes her course different is that she groups the words into categories (of course she does, she’s an SLP) AND she gives you little tips and tricks that help you remember the signs. For example, the sign for pizza (very important to me) looks like you’re putting a slice in your mouth. I use sign language to provide visual support when I’m teaching core vocabulary. It really helps to have multi-modality. In my primary functional skill classroom we use the sign for “more” a lot. I took her course last summer and really enjoyed it. Since I have lifetime access, I go back and check in from time to time for a refresher. So there you have it, another inspirational SLP boss. If you enjoyed this interview, head on over to Adrienne’s site and learn more. Is there an SLP you admire and would like to know more about? Let me know in the comments below. 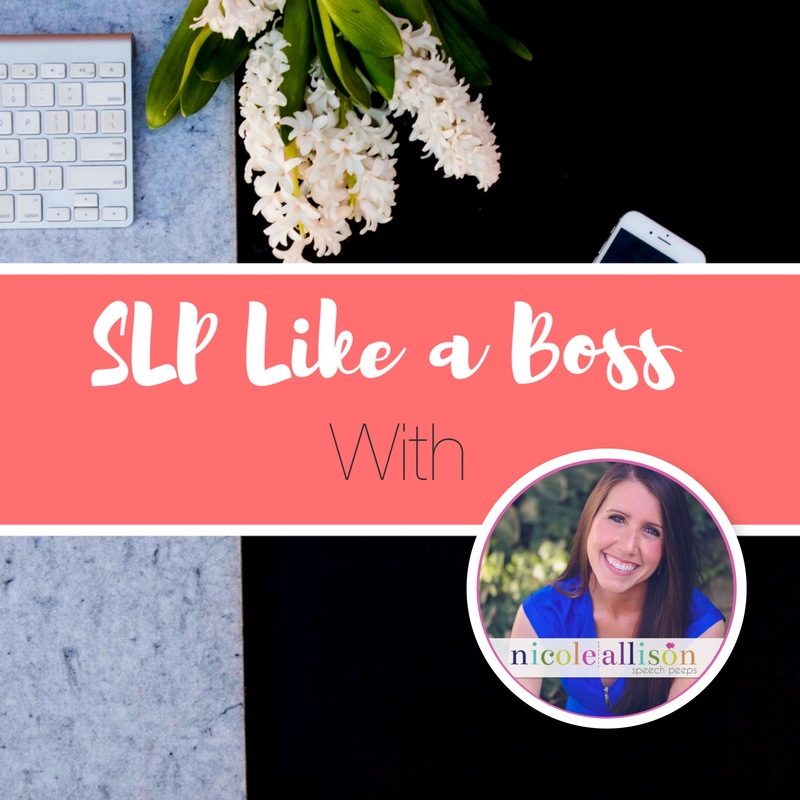 In this series I’m interviewing SLP boss women who work by day as a speech language pathologist, but at night (and on weekends) they are building a business. I’m talking about websites, blogs and therapy materials for their fellow SLPs and teachers. These are women I admire professionally and who inspire me. I write this series because I feel we can all make our practice as SLPs better and stronger by connecting with other SLPs. Can you imagine interviewing a guru? That’s what I felt like when I had the great pleasure of a phone chat with Dr. Carole Zangari. Not only is she is a professor of Speech Language Pathology at Nova Southeastern University(my alma mater) where she teaches AAC classes at the master’s and doctoral level; she also supervises AAC clinical services for children and adults, and administers an AAC lab. She has presented and published on AAC topics in national and international venues. She is a past coordinator of ASHA’s AAC Division. I could go on and on. Suffice it to say, she has opened the doors of AAC for thousands. Where did you go to grad school? : Doctoral degree from Purdue University (where I spent most of my graduate time), Masters degree from College of New Jersey and undergraduate degree from the University of Pittsburgh. I don’t know if you remember Caps for Sale? It’s a oldie but a goodie. I read it when I was a kid. It’s so fun for describing and acting out. All of the Alexandra Day books about Carl, like Good Dog Carl. They are so language rich, with a cool take on absurdities. They have almost no text, just the beautiful illustrations. I feel so inspired now! How about you? If you’d like to know more about AAC, please go to the award winning blog Praactical AAC. Did you like this post? Comment below and scroll down to the bottom of the page to subscribe to the Beautiful Speech Life tribe, we’d love to hav you! Today I’m welcoming my colleagues (and friends) Sarah and Lisa from SLP Toolkit, to share with you how they quickly and efficiently gather data for a transfer student. You know…the one that shows up with an IEP that expires in three days. It’s happened to all of us right? 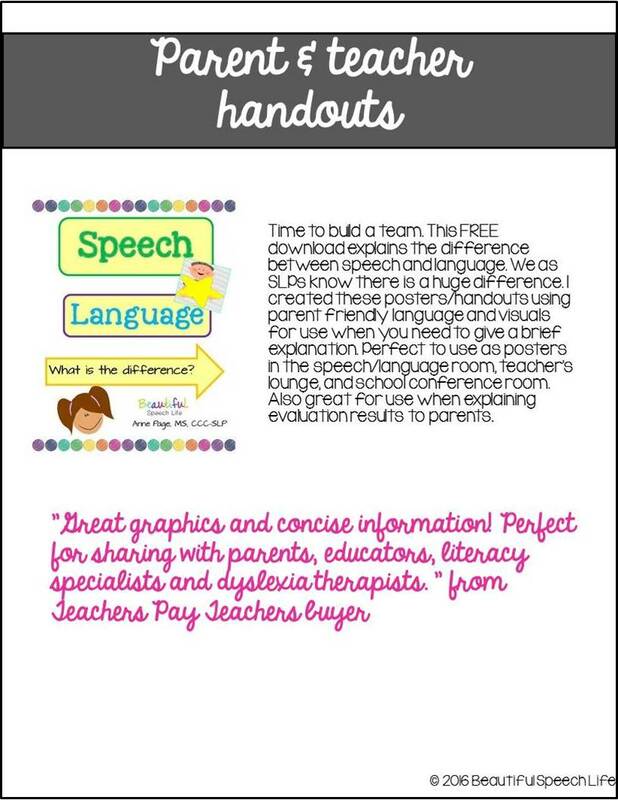 Just for a little background info, SLP Toolkit is a web based software program that was created by two speech language pathologists. Lisa Kathman and Sarah Bevier. I’ll provide some links at the end of this post so you can learn more. Let’s jump right in and see what they suggest. The transfer student is the bane of every school-based SLP’s existence. The student pops onto your caseload, often with an IEP that is expired or soon to expire, with about 12 goals that you have no idea how the previous SLP even measured. So what if that is the case? The IEP is due immediately and you don’t know the student. The school year is in full swing and you are way beyond the start of the year “getting to know you” activities. How do you get the data you need to write a new IEP for a student you just met? Well, if you have SLP Toolkit in your arsenal, there’s no need to panic! 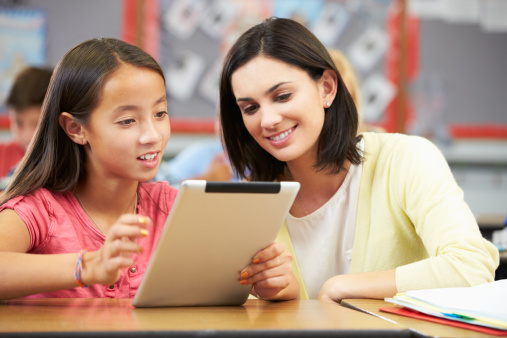 First, you add the student to your caseload and open up a Present Level Assessment (PLA). As a new student, giving all components of the PLA will provide you with a really comprehensive communication profile. These assessments contain both descriptive language (e.g. language sample, narrative or expository retell) and specific skill based (e.g. vocabulary, answering questions, grammar, problem solving) measures. The software scores everything for you, noting areas of strength and need, as well as provides an auto-summary of results that can be copy and pasted into the present levels section of the student’s IEP. With a comprehensive present levels section, the rest of the IEP writes itself since your goals and service time are driven by this information. You can probe areas of weakness further using criterion referenced tests in the ‘Progress Monitoring’ section of SLP Toolkit. Criterion referenced tests measure the student’s performance against a fixed set of predetermined criteria. You will use this information as baseline scores on your IEP goals and then re-test at each grading period using the same measures. To ensure you are writing measurable goals that unfamiliar readers can understand, the SMART goal drop downs in the ‘Goals’ section of SLP Toolkit makes writing an objective, measurable goal a breeze. If any of the students needs can be met through accommodations versus goals (or if these are needed in addition to specialized instruction), you can browse a wide variety of options in the ‘Teacher Strategies/Accommodations’ section of SLP Toolkit. Transfer students only cause panic if you don’t know what to do with them. With SLP Toolkit on your side, you have a step by step guide to ensure you can develop and carry out a comprehensive treatment plan for any new student on your caseload. $19 to apply to either one free month or towards an annual membership. Just click on the pink rectangle to learn more and sign up. Remember the code is BSL16 for your special discount. This link is an affiliate link, which means, if you choose to purchase through this link, I’ll earn a commission. This commission comes at no additional cost to you.. Please understand that I have experience with this company and I recommend it because it’s helpful and useful, not because of the small commission I make if you decide to purchase. How do you deal with behavior issues? Behavior Management for the SLP is so important. I know when I have groups of busy, excited, talkative students sometimes they don’t automatically do what I want them too. I don’t want to spend my whole session dealing with behavior. Pretty sure you don’t either. But the reality is, many times you will have to teach students how you want them to behave. 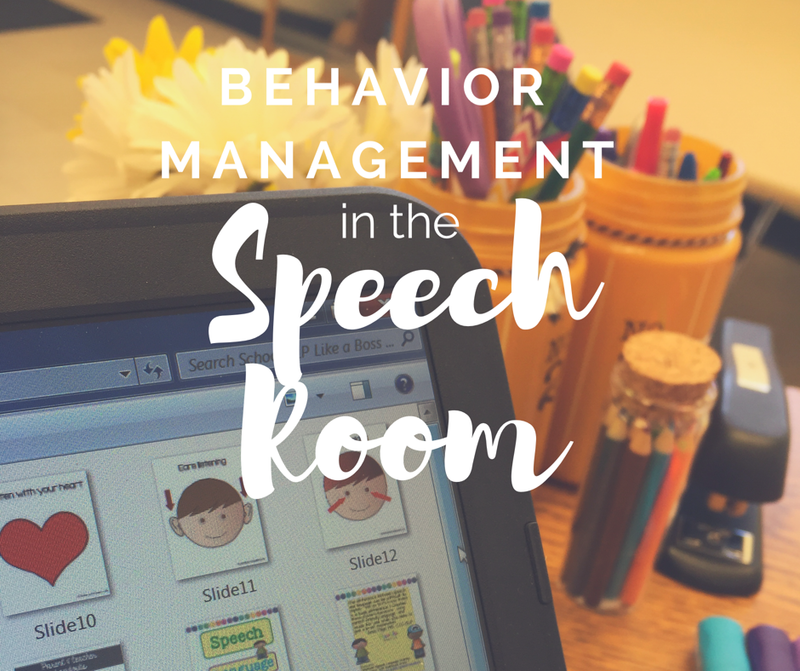 Today I want to give you a quick read (seriously less than 5 minutes) giving you an idea of how you might want to use the behavior handouts in your speech room. 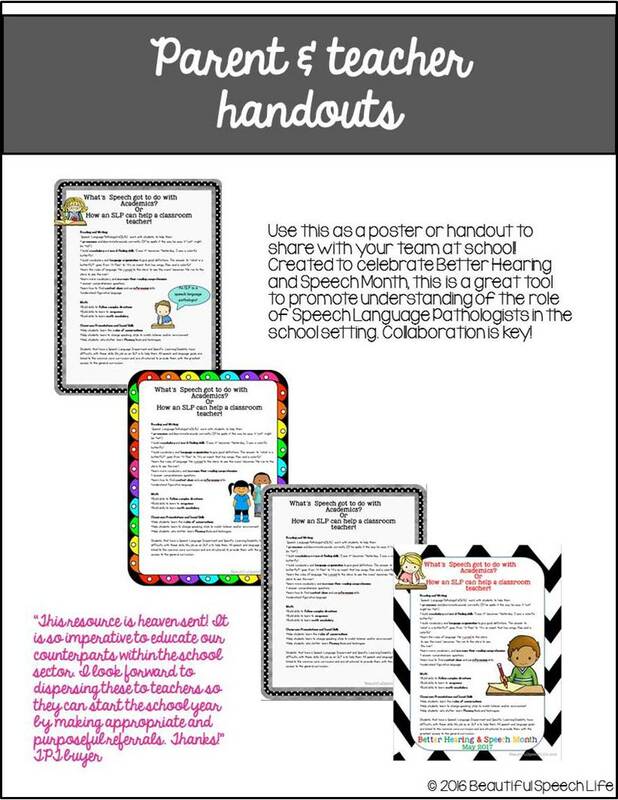 The tools I use for classroom behavior management are included in the kit: listening posters and whole brain posters. These visuals are a life-saver, they serve as a constant reminder and have the added bonus of being easier for our language impaired students to understand. (Sometimes you know they’re just hearing our words sound like “blah blah blah”). Print and laminate these posters. Place them where your students can see them from your therapy table. These are great for the primary grades. Explain each poster. For example: “This is what we need to do to be a good listener.” Point to each picture, read caption and demonstrate. Have the students show their eyes looking, ears listening, etc. After you go through all the posters, have students say them with you as you point and show you again. This is so worth taking the time to do. Remember you want to set them up for success. As you go through an activity, catch your students doing the right thing. Don’t wait until you have to say “where are your looking eyes?”. Give some positive feedback. “I like how Johnny’s eyes are looking right at me. I know he’s listening.” Kids need ten positive statements to every negative. Positive praise helps children become more aware of what they’re doing well, and more excited to continue trying. Make your feedback specific. It’s so easy to just say “good job”. But when we give specific praise, students know exactly what they are doing right and why you are happy about it. So instead of “great job”,try, “You are sitting quietly and looking at me, I know that you are learning”. When you do need to give a verbal reminder to get the behavior you want, point to the poster while you say “Remember, mouth quiet”. And then fade the verbal prompts and just point. 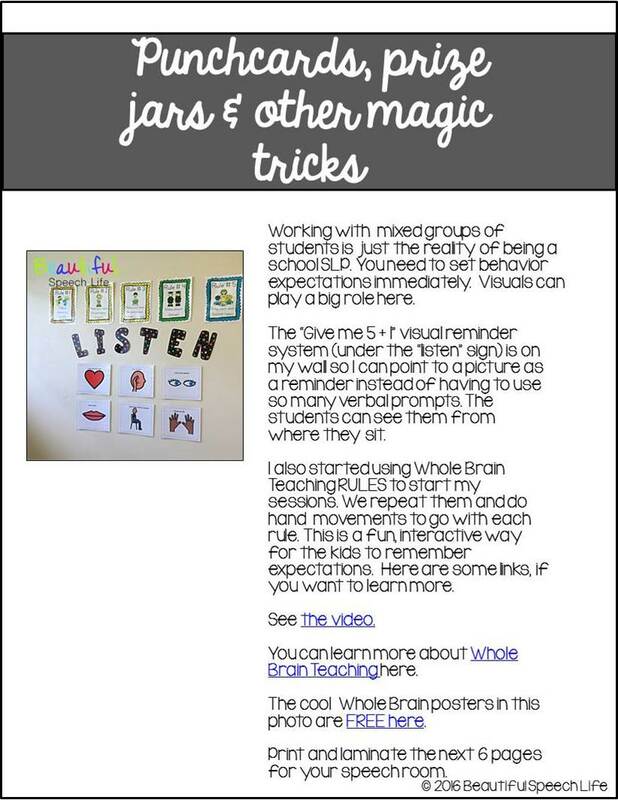 I also have had really great success with the Whole Brain Teaching posters. I use these to give my busy little friends a routine to follow right when they come into the room. As soon as they sit down, we go through each rule. This is really fun and kind of bonding. Once they learn them, I let a different student be the leader each time. I use these with primary students. But you can use them with older students too. You just need to have different posters and a more age appropriate way to say the rules and make the motions. 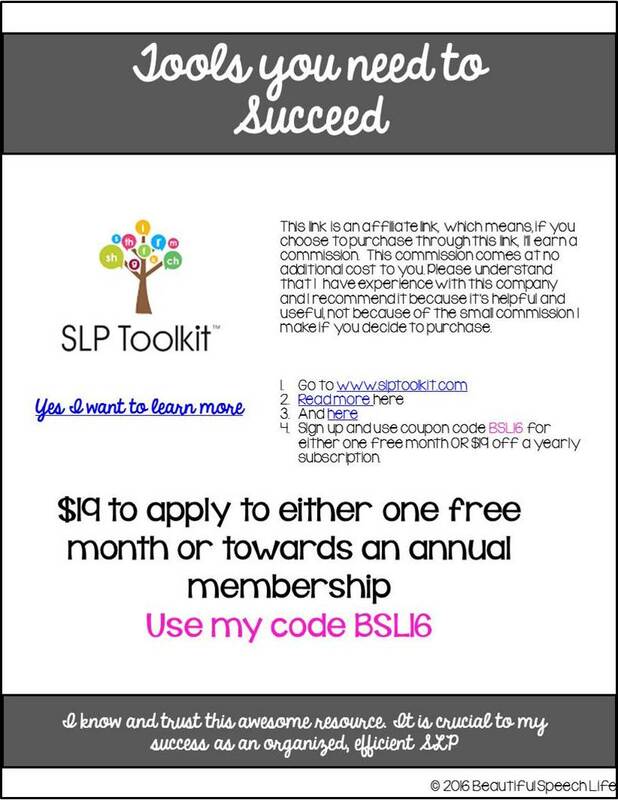 Go to the FREE Whole Brain link on page 9 in your School SLP Like a Boss Smart Start kit. Print and laminate the Whole Brain Posters. Click on the video link to see an example of how they are used. 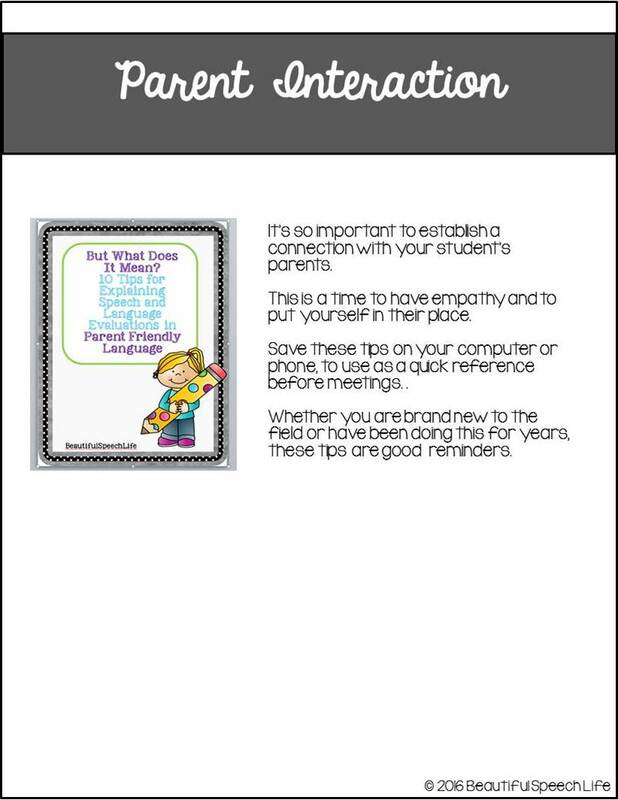 I hope these tips have you on your way to great behavior management. Following these will help you foster better relationships with your students and help them feel secure knowing exactly what the speech room boundaries and expectations are. Nicole Allison at Allison Speech Peeps wrote a really great article on how she uses Whole Brain Teaching during therapy. School SLPs! Feeling overwhelmed and frazzled? Two weeks into the school year and already feeling a tiny bit overwhelmed? It happens! With IEPs, evaluations, scheduling, team building and oh yeah, THERAPY, you’re probably wishing there were more hours in a day. Believe me, I’ve been there. But, if you’ll remember, we’re working on building ourselves some systems; an SLP foundation that will provide an evergreen underlying structure. This way you don’t have to reinvent the wheel every year. You’ll feel calm and collected whether you’re walking into a meeting or walking into your therapy room. 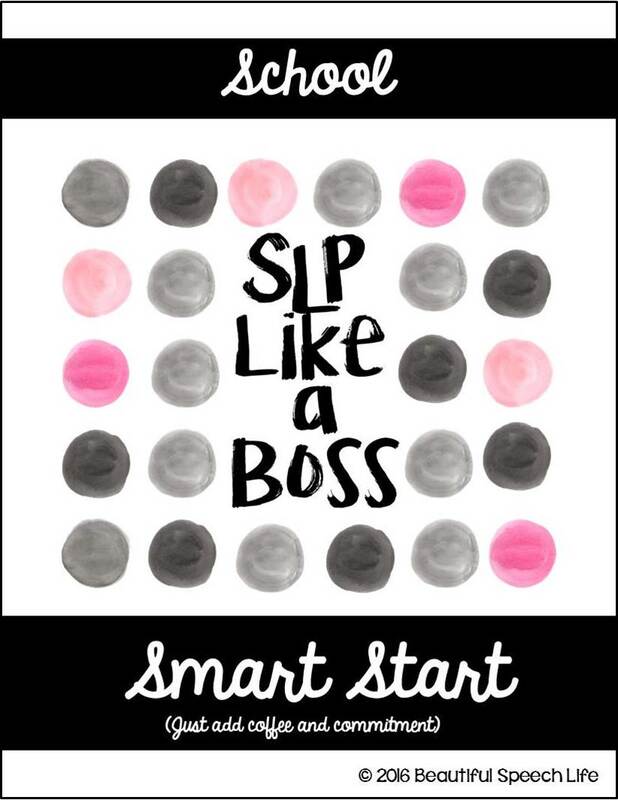 That’s why I created the FREE School SLP Like a Boss Smart Start Kit. Using it will help you feel more organized and on top of your game in no time! This 62 page kit includes some super helpful resources that you’ll find yourself using year after year. You might want to read this before you print anything. Let me walk you through the best way to use this step by step. Step 1: Read Letter to a Young SLP-get inspired! Step 3: Go to the FREE Whole Brain link on page 9. Print and laminate the Whole Brain Posters. Click on the video link to see an example of how they are used. I use these to start every session for my K-4 students. I still use it with my junior high functional skills class, we just do the movements in a more “adult-like” manner. Step 4: Choose the Speech Punchcards you like and print them. Now, I use the color version because kids love colorful things. I also include a black and white version because of Murphy’s Law-color copiers are most likely to break, jam, or run low on ink when you just have 5 minutes to print something. These are such easy prep, just two cuts per page and you are ready to go. 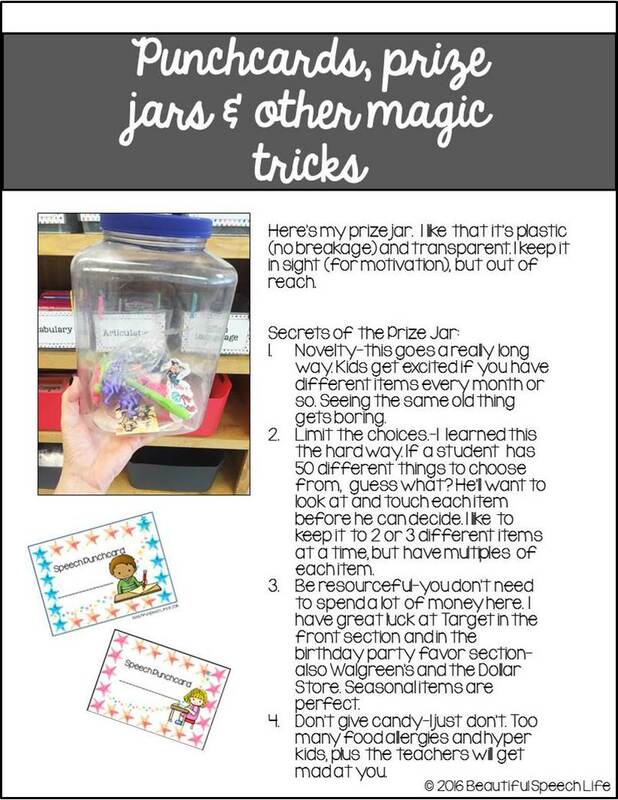 Step 5: Get yourself a prize jar or box. Make a trip to Target and/or the Dollar Store for some cheap, fun prizes. Read my tips for how to keep it interesting on page 17. Step 6: Print the “Speech Language, What is the Difference?” posters. Decide where you want to put them. Some ideas are: speech room bulletin board, staff room, and conference room. They are also handy for parent teacher conferences, staff development days and evaluation meetings. Step 7: Look through the parent teacher handout section. 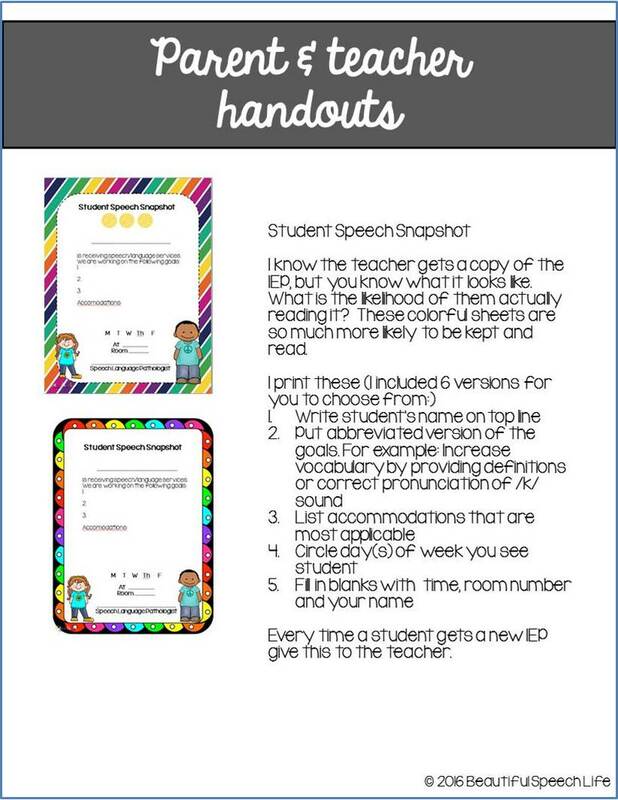 Choose some of the “What’s Speech got to do with Academics?” handouts to have on hand for IEP and eligibility meetings. These can be used as posters too. Bonus: I included on to use in May 2017 for Better Hearing and Speech Month. See?! Look how on top of the game you are already. Step 8: Choose the Student Snapshots you like best. Print one for each student on your caseload, plus some extras to fill out as IEPs are reviewed and revised. (I just keep the extras in a file folder) Follow the instructions on page 32. Step 9: Read through “But What Does it Mean? 10 Tips for Explaining Speech and Language Evaluations in Parent Friendly Language”. This is important stuff that will help you to make that all important connection with parents (a big part of being an SLP Boss). If you’re a paper person print it out. 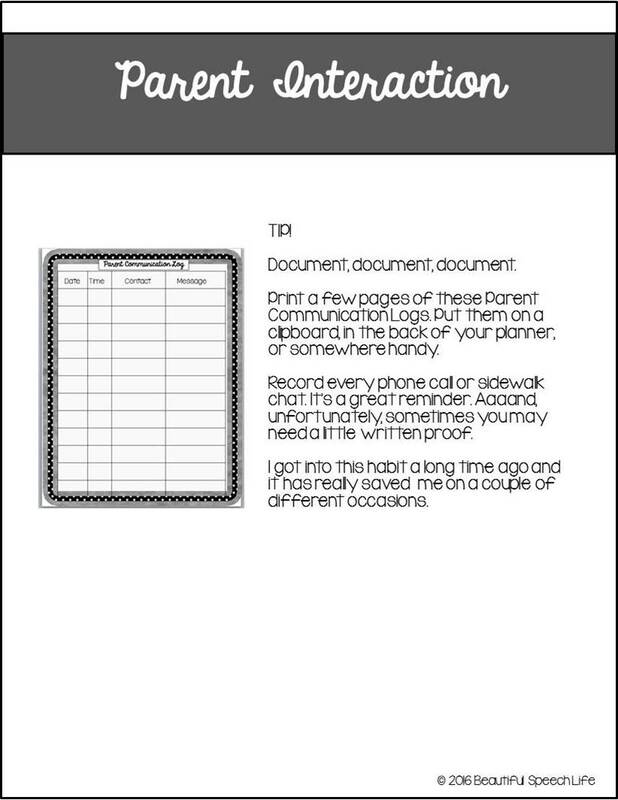 Step 10: Print 3 copies of the Parent Communication Log sheet of your choice. Use this all year. See instructions on page 51. Step 11: Print and laminate testing sign. 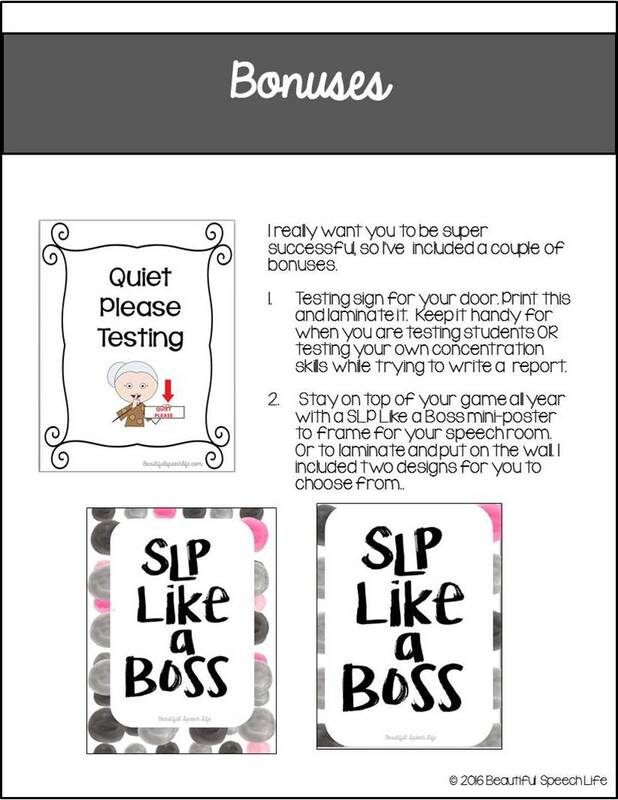 Step 12: Print and frame (or laminate) you’re favorite SLP Like a Boss Poster. It’s my little present to you, a reminder that you’ve got this. 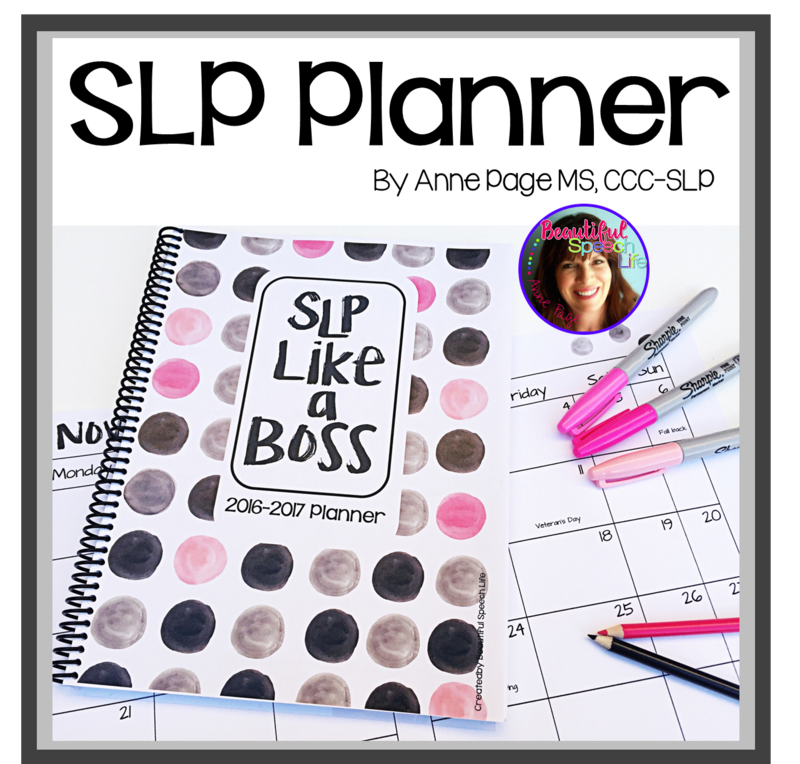 Step 13: Click this link if you need an SLP Planner. This planner is by my side all day. At the affordable price of $5.00, it is chock full of resources. The front cover is the only color page; the rest of the pages are black and white. You provide the color, because doodle borders and coloring pages are included. Yes, it’s true, I do love to color-that might be why I included these fun pages. Step 14: This step can be a game changer. If you are really ready to up your game, have I got a tool for you. It is one of the most used tools in my bag of tricks! SLP Toolkit has saved me HOURS of work. Now I can easily assess present levels and give accurate, helpful progress reports. And the goal bank to-die-for! Go to pages 60 and 61 to read more about it. You can also click here and here to read the articles I wrote about SLP Toolkit. So there you have it! Everything you need to feel more joy and less stress as you get your school year off to a brilliant start. This summer I was so thrilled to meet Nicole Allison in Florida at the Teachers Pay Teachers Sellers Conference. Nicole has been listed by many other SLP bosses as truly inspirational and she lives up to her reputation. Not only are Nicole’s therapy materials thoughtfully created, they are evidence based and many are linked to Core Curriculum standards. Her blog features inspiring articles and helpful resources for the busy SLP. Let’s jump right in and get to know her better. Where did you go to grad school? : I went to the University of Akron in Ohio. Go Zips! 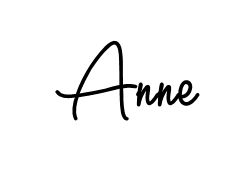 Oh man, these are the hard questions, Anne! I lf I HAVE to narrow it down to one, I would say I absolutely LOVE that I can be a positive influence on my students. So many times, our reach extends beyond “artic, language, and grammar.” We can truly make a difference and be a light in our students’ lives. That student you thought you were getting nowhere with all of a sudden gives you a hug at the end of the year or my group of girls that told me when they grown up they want to be “speech teachers” just like me. Those moments melt my heart and keep me coming back for more. Tell me your advice for the newly minted SLP: My number one piece of advice is to befriend a few teachers. Being the only SLP at my district I often felt isolated. Being an introvert didn’t help matters. Stretch yourself by eating lunch with teachers and truly listen to them. Often they know a lot about our students and can be a HUGE help to us! Lol where do I even start! I starting blogging back in 2012 because, like I said, I was the only SLP at my district and I NEEDED support. For REAL friends-I probably wouldn’t have survived without the support I found through blogging! 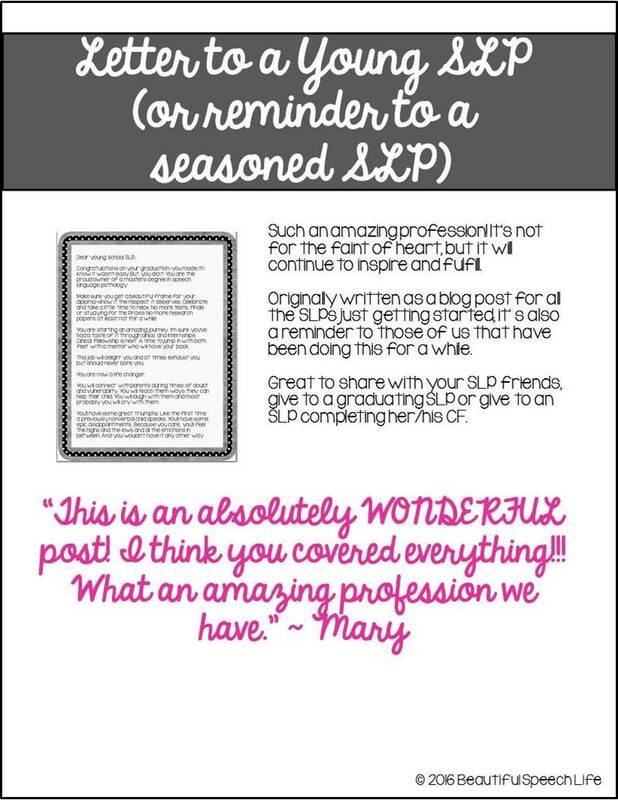 I want my blog to be a safe haven for other SLPs. A place they can come and truly feel rejuvenated about our profession and walk away with fresh ideas and resources. TPT came about because of the encouragement of my husband. I started blogging with no intention of making or selling resources. I remember the summer I spent SEVERAL hours making my Common Core aligned goals. I created it because I needed it. My husband was the one who said, “Well, if you need it, maybe others do too.” Since then, that’s been the whole philosophy behind my TPT store. I create out of a need for my own students and hope others can benefit from as well! What SLP-boss inspires you? Just one?! I have sooo many that I truly look up to! I saw Jenna’s Speech Room News way back when and said “THAT’s want I want to do!” but I would also say Lauren LaCour from Busy Bee Speech. This girl truly walks the walk when it comes to her relationship with Christ. It’s a beautiful thing when you can find that special friend who pushes you in your own faith. I LOVE Fancy Nancy books so much so that I even own the Fancy Nancy doll lol! They are the best for working on vocabulary while still having relatable stories. What about picture books? I really like the book (and so does my toddler) “A Ball for Daisy.” It’s perfect for working on story-telling and interpreting emotions. I always reach for books that you can incorporate multiple goals into! Be sure to follow Nicole’s blog and check out her TPT store by clicking on these links. P.S. I wrote a guest blog post for Nicole about stepping outside of our four walls as SLPs click here to read.